Copper wire has many unique properties. 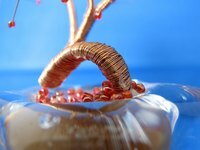 In addition to conductivity, which makes it a staple in electrical appliances, copper wire boasts pliability, sturdiness and a lustrous sheen. People are finding more and more uses for these qualities, which has turned copper wire into a popular material for different projects. The things to make with copper wire range from arts and crafts to scientific experiments. Copper wire may come in different colors, but costume jewelry makers often choose to keep the natural reddish-gold hue, especially when capturing earth tones. Like gold, copper is very malleable. Beginners use copper because it is easy to mold into the desired form or design. The problem with copper is that it tarnishes, like silver. Tarnish not only darkens it but also leaves stains on skin or clothing. If this happens, all you need to do is polish it. Household substances like vinegar have success in helping clean copper. Basic jewelry making with copper wire requires beads or punctured stones and pliers that can help in twisting wire into coils and clasps. Different sizes of wire go with different kinds of jewelry. For beads or stones with tiny holes, for example, wires that are in the range of .40-.50mm work best. A slightly larger size that can endure a lot of manipulation and yet remain bendable will work as clasps. Jewelry is not the only craft project that showcases copper wire. It can decorate greeting cards, notebook covers and scrapbooks. The board or paper should be thick enough to bear the wire's weight. Featuring copper as a major art design might require thicker, more visible wire. Glue the wire parallel to the edges of the cardboard or paper to frame the cover design. Use pliers to fashion it into flowers, insects or simple geometric shapes. Paint inside the wire to embolden the design. The effect is like clay art, as wire sculptures on paper will seem to jump out from the page. Copper wire can also create a variety of ornaments and decors. Whether it's Valentine's Day, Thanksgiving or Christmas, its red-gold sheen is perfect for molding little sculptures of hearts, turkeys and decorative balls. Hang these from the ceiling or on the tree. Twisting several lengths of thin wire together will also produce sturdy but attractive handles for jewelry organizers or candleholders. Finally, because copper is a good conductor, you can try your hand at experimental projects like electrical circuitry. This requires a working knowledge of physics and electric wiring. If your efforts to build a homemade generator or a Tesla coil do not yield results, decorate your workroom with these experiments or recycle the wire. What Is the Easiest Way to Color Copper Wire?